“Valentina stirred awake and found Mrs Ivanova leaning over here bed, gently squeezing her shoulder. Born in Russia and raised in an orphanage for five years, Wallis Stoneman can’t remember much of her life before Claire and Jason adopted her. Now 11 years on she resents them for things they can’t fix, including their marriage. Jason is married to another woman, Claire is overbearing and Wally has decided that street life is better than living the lie that Claire set up for them. Things take a serious turn for the worse when Wally uncovers some information left for her by her birth mother, she decides to start the search for her mother but soon learns that she’s not the only one looking. Her father, a Russian mobster is on the lookout too and he will stop at nothing to find what he’s looking for. 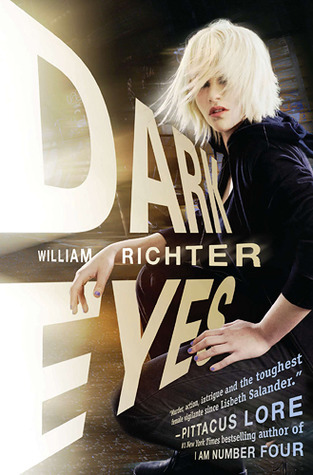 The premise of Dark Eyes sounded brilliant when I read about it, and the fact it was likened to The Girl With the Dragon Tattoo really made me really want to read it. Whilst it was a good read which I enjoyed, it didn’t really live up to my expectations. I enjoyed the story, you are pretty much thrown straight into it as a girl is found dead on the streets within the first few pages. I wanted to know instantly who she was, was she Wally, a friend, an enemy, how was Wally involved if it wasn’t her? I loved that aspect of the story and I seriously didn’t think it dropped pace anywhere from then on. Once things developed and it was obvious that the girl wasn’t Wally, Wally starts on finding out more about her life and it was brilliant. I loved that you got to see a bit of Wally before she starts looking and how it changes her. I also enjoyed the narrative and the way that the reader was focussed on more than just Wally and there were others involved like Atley Greer. The characters added a lot to the story and I loved the family unit that Wally and her friends had built up. Tevin was adorable and Ella and Jake were such a wonderful couple, but always leaving enough room for Wally and Tevin. I would have liked to know more about their background but this wasn’t their story and we are told enough about them. Waly was a tough character with a lot of guts, she messed up a lot in the beginning but as the book went on she developed well and I loved her by the end of the book. Claire was odd and I knew there was something a little off about her but I think it was the detachment to Wally that I was sensing more than anything else. There were a lot of characters which had bit parts who were very integral to the plot but you don’t really connect with them. I really liked the Doctor and Atley but you didn’t get much of the doctor and Atley only became someone more than a detective searching for Wally towards the end of the book. The writing was the thing that really let this book down for me. It was written as adult crime fiction, or at least thats what I gathered from it; I haven’t read much adult crime-fic. I felt that it was however a dumbed-down version almost, with a lot of the clues put out there for all to see easily. I worked out a lot of things very early on and although there were twists and turns put in the wayI still worked things out that should have been a lot harder to work out. The book was really descriptive which was good in some senses but I think that was the reason I worked things out too quickly and also something which bugged me a lot. It seems petty but I didn’t like the use of ‘youths’ and ‘teens’ to describe the characters within Wally’s unit, it made sense in some places, like when the focus was on Atley but when it was on Wally it completely threw me off the story. Also the use of ‘emo’ and ‘scene kid’ to describe Wally and Ella was a bit jarring, this was only twice I think but at both points it was when the narrative focus was on Wally and it didn’t work for me. I don’t want to say this book wasn’t good, it was really good. I don’t want to make it sound like I hated it, because I didn’t. I really did enjoy it, and I think it reads quite well for the most part. I just thought it was a little more obvious that it should have been. I think, and hope, that a lot of people will enjoy it, especially those who are interested in crime fiction but aren’t sure of where to start. Dark Eyes was published on August 2nd by Razorbill/Penguin. My copy was provided by the publisher in exchange for an honest review. I enjoyed this one – I agree that it was on the predictable side (the blurb on the back really doesn’t help it either, giving far too much away!) but no more so than some adult crime I’ve read.